After a rowdy first day which ended with a roaring speech by First Lady Michelle Obama, the Democratic National Convention gets down to business on Tuesday as delegates prepare to make history. The day will start with a roll call vote as Democrats officially make Hillary Clinton the first female presidential nominee from any major party. The big speaker of the night is Bill Clinton, delivering his 10th consecutive convention address. But before the former Commander-in-Chief makes a case for his wife’s presidency, expect some high-caliber Hollywood stars to serve as ratings magnets. Actress Elizabeth Banks will serve as host for the evening. 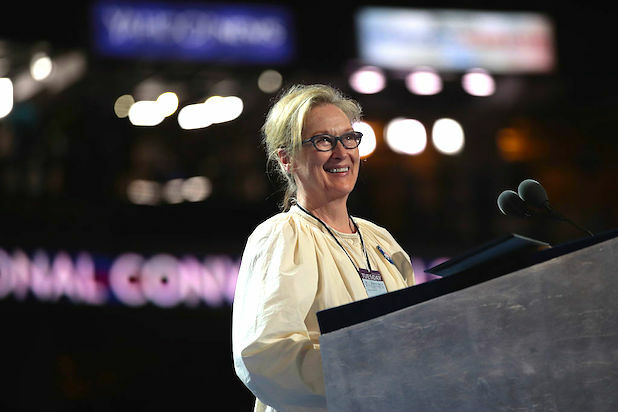 She will be joined by a cadre of Clinton celebrity backers, including Tony Goldwyn, who plays fictional president Fitzgerald Grant in ABC juggernaut “Scandal;” “Will & Grace” star Debra Messing; “Girls” creator and star Lena Dunham; America Ferrera; Erika Alexander (“The Cosby Show,” “Living Single”) and Meryl Streep, who will introduce a film. Singers Andra Day and Alicia Keys will perform. Mellott and husband Mark’s adoption of their son was made possible through the 1997 Adoption and Safe Families Act that Hillary championed as First Lady. Freeman grew up in foster care and is a former intern in Hillary Clinton’s Senate office. Since receiving his law degree, he has worked to bring opportunity to kids at risk. As a senator, Hillary Clinton supported the creation of the Eagle Academy to educate at-risk youth in New York City. Sweeney was a detective with the NYPD on September 11, 2001. When the towers were hit, he rushed down to the World Trade Center and began digging through the rubble for survivors. Manning spent more than six months in the hospital after 9/11 recovering from severe burns. As senator, Hillary Clinton helped Lauren get the care she needed. Ryan has spondyloepiphyseal Dysplasia dwarfism and has known Hillary Clinton since 1994 when they met during the fight for health care reform. Ryan has stayed in contact with Hillary ever since. Democrats boasted that their convention would be unified, unlike the occasionally messy Republican National Convention. But Bernie Sanders supporters made sure people arriving by train at the Wells Fargo Center in Philadelphia would know that they didn't stand with Hillary Clinton. The party seemed confident that Sanders and Clinton supporters could come together for the convention -- but that was before leaked Democratic National Convention emails suggested the DNC had favored Clinton's campaign over the Vermont senator's. Inside the hall, the party presented a message of unity. Outside, that wasn't the vibe. 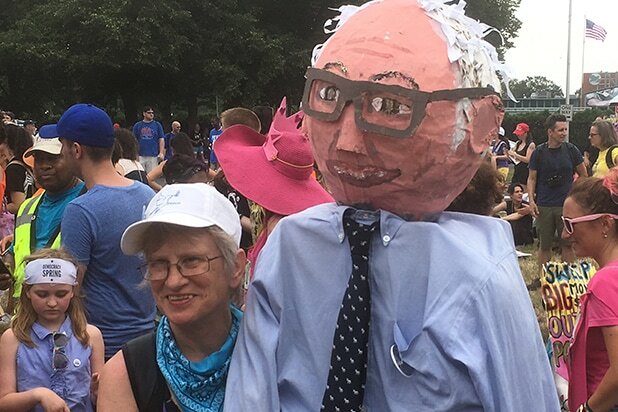 The crowd included liberal Democrats unhappy with Clinton, people who only got involved in the political process to support Sanders -- and people who just want a cleaner political process. Some Sanders supporters said they still hoped Bernie could be the Democratic nominee, perhaps because of the scandal over the leaked DNC email. Kelly Brooks and Jordan Stevens traveled from Lansing, Michigan, to support Sanders. "He's not out. Not until the delegates vote," said Brooks, 27 (left). Stevens, 23, said Clinton is trying to get women to vote for her "just because she's a woman ... and I think that's the exact opposite of feminism." Brooks is considering voting for Green Party candidate Jill Stein. "Bernie or Jill but never Hill," she said. "And if Trump gets elected I'm gonna have to move to Canada." The rally included causes not directly related to the question of whether to support Clinton or Sanders. Some of the most vocal protesters chanted that they were undocumented and unashamed. A Philadelphia rally wouldn't be complete without an appearance by this classic "Always Sunny in Philadelphia" character. The Green Man endorsement will be crucial in the 2o16 presidential race.